During the 2018 partial government shutdown, which affected the timely reporting of housing market data, we began exploring alternative sources for that data that are providing a more detailed picture of recent trends in the residential real estate market at the state level than is possible with the data that U.S. government agencies regularly publish. We're finding Zillow's data for existing home sales to be especially useful, since it covers 41 states and the District of Columbia, where we can get a pretty good idea of individual state-level trends, which we can quantify by the estimated total valuation of existing home sales within these regions. Take the west coast of the continental United States for example where the three states of California, Oregon, and Washington all fall within the top 10 for having very expensive housing in the U.S., with California ranking second (after Hawaii), Washington ranks sixth, and Oregon ranks eighth in the nation according to the measure of median home values. We've used Zillow's data to drill down into the recent history of existing home sales in each of these three states, where we find they share a unique trend that took hold after March 2018. 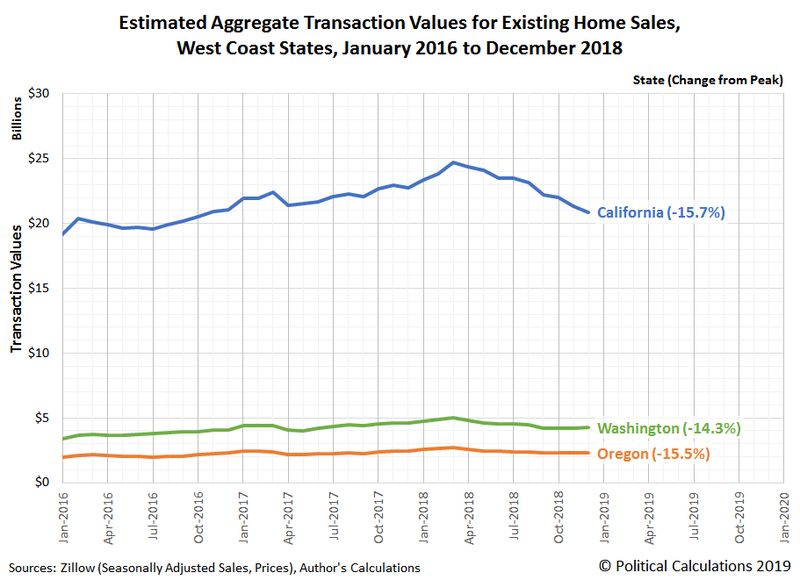 The following chart shows our estimates of the total valuation of existing home sales in California, Oregon, and Washington from January 2016 through December 2018. All three states saw their seasonally-adjusted total valuation of existing home sales peak in March 2018, where through December 2018, each has experienced a 14-16% decline.